C.L.A is the most abundant polyunsaturated fatty acid (PUFA) found in human tissues. Most of the C.L.A in the body is of dietary origin, obtained mainly from dairy and meat products. However, due to modern farming methods, food processing and modern diets (high amounts of convenience foods which can be high in saturated fats and low in PUFA’s); the amount of C.L.A we can obtain from food is reduced. C.L.A can be converted within the body into hormone like substances (prostanoids and leukotrienes); these may regulate blood vessel, lipid (fat) accumulation and immune cell behaviour. C.L.A also may support healthy levels of body fat, whilst maintaining skeletal muscle mass. The action of C.L.A is reliant on zinc, therefore normal levels of zinc are required. 2-4 capsules to be taken 1-2 times per day or as professionally directed. 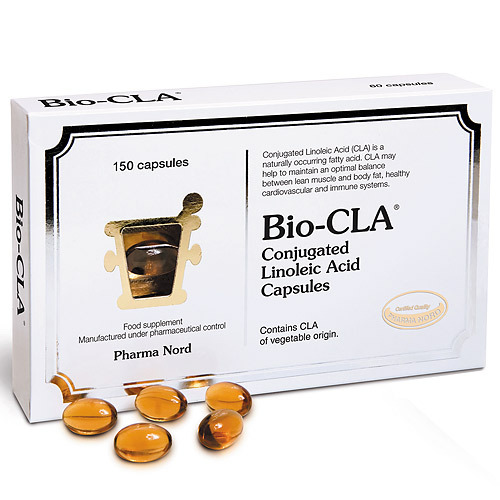 Below are reviews of Pharma Nord Bio-CLA - 150 Capsules by bodykind customers. If you have tried this product we'd love to hear what you think so please leave a review. 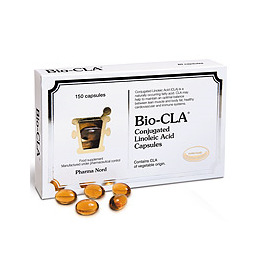 Pharma Nord Bio-CLA can help maintain healthy cardiovascular and immune function.